Dr Simon Bariol is a urological surgeon with a particular interest in endourology, a urological subspecialty which encompasses the minimally invasive management of urinary tract stones, benign and malignant prostate and kidney disease. His expertise in this area allows most patients with prostate disease, kidney and ureteric stones, tumors of the kidney or ureter, or narrowing of the ureter to be treated either without the need for an incision, using laser techniques, or with keyhole "laparoscopic" surgery. Dr Bariol is appointed as a Visiting Medical Officer at Westmead and Blacktown Hospitals, Westmead Private and Norwest Private Hospital. 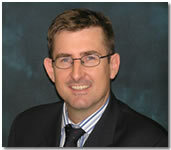 He is a senior lecturer at the University of Sydney and supervises urology training at Westmead and Blacktown Hospitals. This web site is not intended as a substitute for your own independent health professional's advice, diagnosis or treatment. Always seek the advice of your physician or other qualified health provider within your country or place of residency with any questions you may have regarding a medical condition.